Yovanoff’s book covers always grab my attention. Paper Valentine is no exception. -Underlying message— No one is perfect. We have to learn to be happy in our own skin and not care what others think. -Stand alone title. Not a series! -Genre-hard to classify. 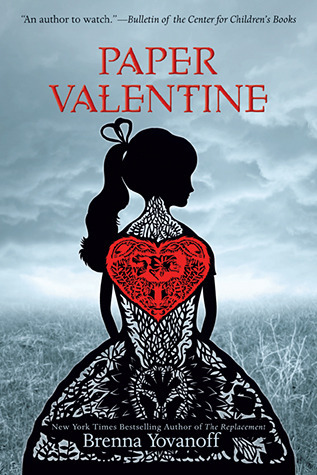 It includes a mix of different elements: romance, paranormal, mystery, thriller. While the storyline centres on the murders, it is also a book about a girl coping with her best friend’s death. Although never referred to as ‘anorexia’, it is clear that Lillian died from the eating disorder. How Hannah describes the appearance of Lillian’s ghost and the smell of her breath is truly disturbing. Hannah’s guilt is prominent throughout, and only in the end can she finally let go. I thought Hannah made an interesting main protagonist. She loves putting her own spin on her clothes and aims to stand out from the rest of the crowd. Although she feels guilty for her role (or lack thereof) in Lillian’s death, she puts on a smile and pretends she’s happy. I liked how her love interest, Finny challenges her to be real and accept those emotions. Although I didn’t see the end twist coming, I figured by the number of pages left that something was around the corner. However, I had big questions surrounding the killer’s motive. Why kill young girls? To demonstrate power? For a thrill? It’s a HUGE leap from shoplifting to murder. I didn’t get it. I also didn’t quite grasp the reason for all the dead birds and the constant mentioning of heat. I definitely thought it was so sort of eerie foreshadowing. Overall, I think Yovanoff did a great job at weaving together an interesting murder mystery. The book tackled plenty of issues to keep readers hooked and guessing. The Ouija boards and séances really upped the creepy factor. Kami Glass loves someone she’s never met…a boy she’s talked to in her head ever since she was born. She wasn’t silent about her imaginary friend during her childhood, and is thus a bit of an outsider in her sleepy English town of Sorry-in-the-Vale. Still, Kami hasn’t suffered too much from not fitting in. She has a best friend, runs the school newspaper, and is only occasionally caught talking to herself. Her life is in order, just the way she likes it, despite the voice in her head. For some reason, I didn’t connect with this book. There’s nothing that I disliked about it, it’s just nothing really stood out to me. I read it last week, and already it’s a little forgettable. That being said, I know tons of readers that would completely disagree with me so I urge you to give it a shot! -pacing and plot- keeps readers guessing. Lots of action/suspense. -Book set up. I loved the table of contents at the beginning, highlighting the parts/chapters. The novel is divided into six parts, and includes quotes by Robert Frost, Elizabeth Barrett Browning and others. The quotes helped to set up the tone of the section. Personally, I like my books to have some sort of resolution at the end. I think readers that were emotionally invested will be very unsatisfied and perhaps a little angry with the ending provided. Readers will have to wait for the sequel ‘Untold’ to get the conclusion they crave. Yay! 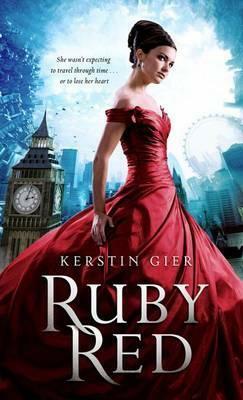 My guest blogger, BookIt returns with a review of Ruby Red. Enjoy! 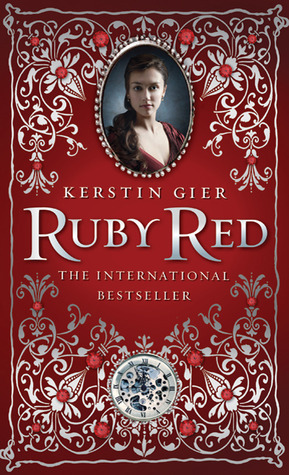 Ruby Red is the first book of a popular German trilogy that has been recently translated and getting great reviews. The first two books Ruby Red, and Sapphire Blue are available in English, and the last book Emerald Green will hopefully be released in English later this year. Gwyneth comes from a family of time travellers, in which the time traveller gene is passed down each generation to one female. They are then burdened with the mysterious responsibility of helping to complete a secret mission under the guidance and control of a secret society known as the Guardians. Right from the beginning you can tell that it will be the inexperienced and funny 16 year old Gywenth, and not her perfect and snotty cousin Charlotte that will end up with the gene. Although, predicable for the reader, it leads to a fantastic storyline in which you can’t help but root for the heroine as she learns the ropes of this new and exciting world in which she has been destined to play a crucial role. I loved so many things book. Set in Britain, the British translator Anthea Bell, did a fantastic job of ensuring that the humor and language was authentic to the storyline. I even wondered if she helped to improve the original text. Check out this link from Publisher Weekly in which she answers questions about translating metaphors, puns, jokes etc. Overall, if you are looking for an exciting time travel adventure with a splash of romance that will make you laugh you should pick up Ruby Red. 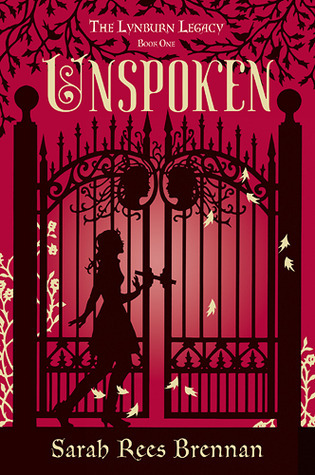 I will say that it is light, sparse of agonising drama, with more of an end of middle school feel and thus could be recommended for the younger readers of teen fiction. Overall it was a 4 out of 5 book for me.